Looking for How to can your own creamed corn from fresh corn-on-the-cob (directions, recipe, with photos and free) in 2019? Scroll down this page and follow the links. And if you bring home some fruit or vegetables and want to can, freeze, make jam, salsa or pickles, see this page for simple, reliable, illustrated canning, freezing or preserving directions. There are plenty of other related resources, click on the resources dropdown above. How to Can Creamed Corn - From Corn on the Cob! If you don't have room in your freezer, but you want to be able to enjoy the corn from your garden this winter, then home-canning your corn is the easy way to do it. Here's how to do make home-canned creamed corn, complete instructions in easy steps and completely illustrated. The corn will taste MUCH better than any canned creamed corn you've ever had from a store. Frozen corn, of course, retains flavor better. 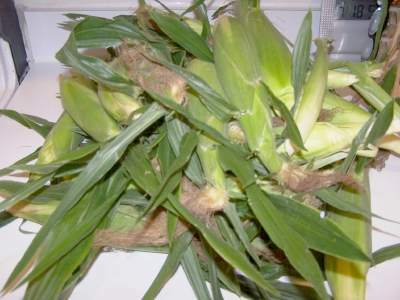 If you want directions for freezing corn, click here. And if you didn't know it, there is no cream in creamed corn; that referes to the texture and released juice or "milk" from the corn! One other important note: you will need a pressure canner. 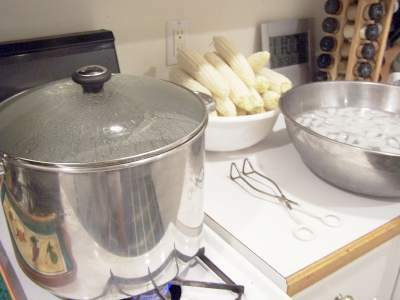 Corn is a low acid food, so you cannot use a boiling water bath canner. It must be a pressure canner. Pressure canners cost more than water bath canners, but they are more versatile and last a lifetime, and your children and grandchildren may be using it. See this page for more information about pressure canners. 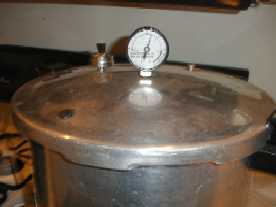 See this FAQ for more details: Can I use a water-bath canner instead of a pressure canner for low acid foods like corn? Hot Pack v. Raw Pack? Hot pack means the corn is heated to boiling before we put it in the jars. Raw pack means it is placed into the jars without heating, and then the jars are processed in the canner. Which is better? Not much difference. Food safety experts prefer the hot pack method, because you can stir the corn the ensure it gets evenly and thoroughly heated. Raw pack instructions are here, should you prefer them. Start with fresh corn on the cob - as fresh as you can get. If there is a delay between harvesting and canning, put it in the refrigerator or put ice on it. The sugars break down quickly at room temperature. 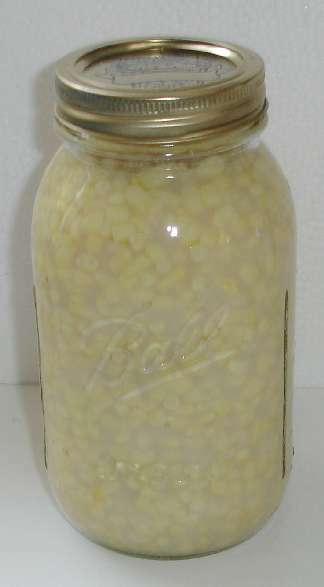 According to the USDA, about 32 pounds (in husk) of sweet corn is needed per canner load of 7 quarts; an average of 20 pounds is needed per canner load of 9 pints. 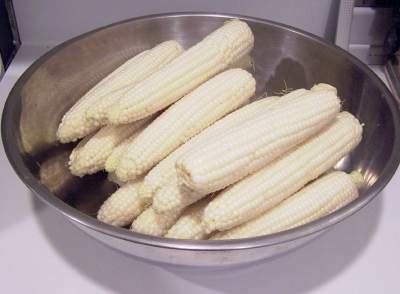 Note that a bushel weighs 35 pounds and yields 6 to 11 quarts of canned corn, which is an average of 4 pounds of corn in the husks per quart of finished canned corn. This is also a good time to get the canner filled (about 2/3 full) with water and start it heating. 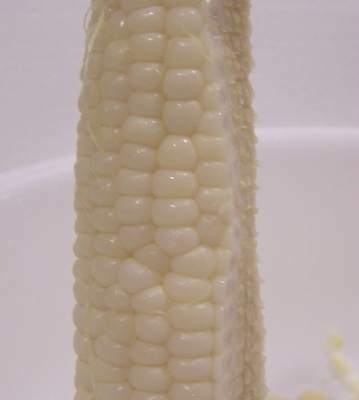 Cream Style Corn Cut kernel tips about 1/2 deep and scrape the cobs with the back of a knife to remove the juice and the heart of the kernel. You don't need a special tool, just a very sharp knife! Some folks use an electric carving knife and report this is the easiest method, and a few use a meat slicer. 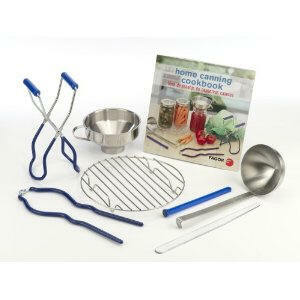 You'll need this to supplement the water in step 10 to fill the jars after you pack them with corn. Dump the cut kernels into a measure cup (so you know how much you have) and then put the corn into a saucepan or pot. Add 1 cup of hot water for each quart of corn. Heat the corn to boiling and simmer 5 minutes. 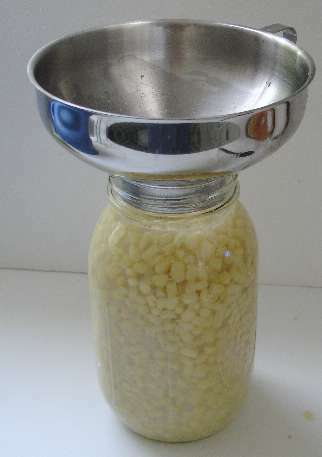 Fill pint jars* with corn, leaving 3/4 to 1 inch headspace (corn tends to expand more than other vegetables). * - Ball and the USDA say to use pint or small sized jars. Wipe the rims of the jars, put the lids on and then the rings on snugly, not not TOO hard. 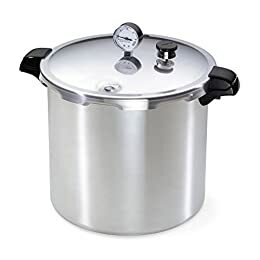 Follow the directions with your pressure canner and process the jars for the times and pressures below depending upon your altitude, type of pressure canner and jar size. My canner is a dial-type, shown at left. Once the gauge hits 10 or 11 pounds (depending on the type you have), start your timer going - for 25 minutes. Adjust the heat, as needed, to maintain that pressure. Note: the chart below will help you determine the right processing time and pressure, if you have a different type of canner, or are above sea level. When the processing time is up, turn off the heat, and allow the pressure canner to cool and the pressure to drop to zero before opening the canner. Let the jars cool without being jostled. 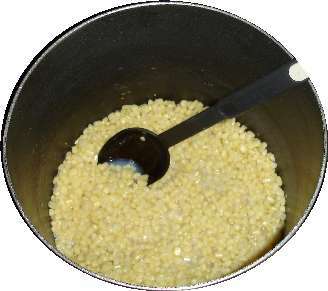 Later, when you are ready to serve the corn, it just takes about 3 or 4 minutes in the microwave (from frozen) or in the top of a double boiler. The corn doesn't need to be "cooked", just heated up! This occurs most often when too high a temperature is used causing caramelization of the sugar in the corn. It may also be caused by some minerals in the water used in canning. Aspirin / Salicylic Acid? My mother canned corn using salicylic acid. 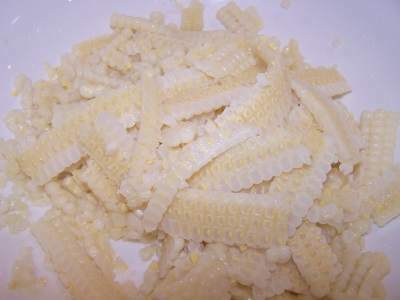 The only recipe I have is: 7 cups corn 1/2 cup salt 1 cup sugar 1t.salicylic acid 1 cup water Let boil several minutes. What do I need to know to can corn using this method? 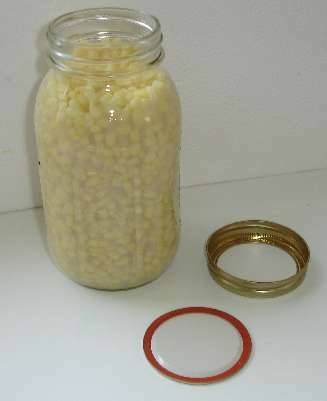 You may have heard of someone's grandmother canning corn by boiling the corn, adding aspirin or salicylic acid from the drugstore, then sealing the corn in jars with no further processing. According to the University of Illinois, a recipe circulated several years ago, using aspirin to acidify tomatoes and beans for canning. Aspirin is not recommended for canning. While it contains salicylic acid, it does not sufficiently acidify low acid foods like tomatoes or beans for safe hot water bath canning. Low acid foods (without added acids) should only be processed safely in a pressure canner. Lemon juice or vinegar is recommended to acidify tomato products for safe water bath processing. You can also see an article in JAMA (the Journal of the American Medical Association, Vol. 289 No. 13, April 2, 2003, titled "Is salicylic acid as a food preservative harmful? "; from which the abstract states: "salicylic acid, in the ways in which it is used in the preparation of food products, is not only not harmful, but is a preservative to health, inasmuch as the process of decomposition which it prevents would be far more dangerous." 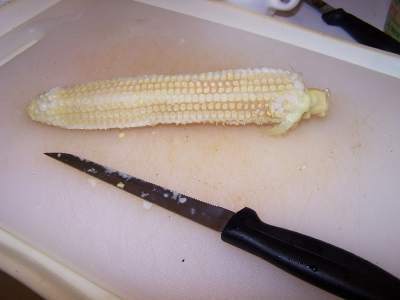 Comments from a visitor on August 15, 2009: "Hi, I just wanted to share that we use an electric knife to remove the blanched corn from the cob. It is the easiest quickest way we have found for this part of the process. Last night we processed 10 dozen ears of corn in two hours. Please pass it on. My 80 year old grandma taught me this trick! Thanks, kim"